Car wax has come a long way since it was first developed in 1800 using animal fats to polish and shine carriages. Today’s car waxes are produced using finely-tuned processes that have elevated the use of natural waxes that include vegetable wax, beeswax, and oils, as well as synthetic bases, to shine and protect your vehicle like never before. Professional detailers, car enthusiasts, and proud car owners alike have the ability to maintain and preserve a car’s finish, but an understanding of wax basics is a must to ensure that you do what’s best for your vehicle. Car wax is a formulated blend of waxes, oils, and solvents which can include crude oil distillates, ethanol, mineral spirits, petroleum, naptha (commonly used as a thinner for wood varnishes and paints), and more. A wax compound adds a layer of protection to the paint and can also bring out the best of your vehicle’s luster and shine. While waxing brings out the beauty of the paint, it’s most important job lies in its power as a protectant. A good wax will see your car’s paint through moisture, UV rays, intense heat, a battery of pollutants, and will help prevent the dreaded oxidation process. II. What is Carnauba Wax? 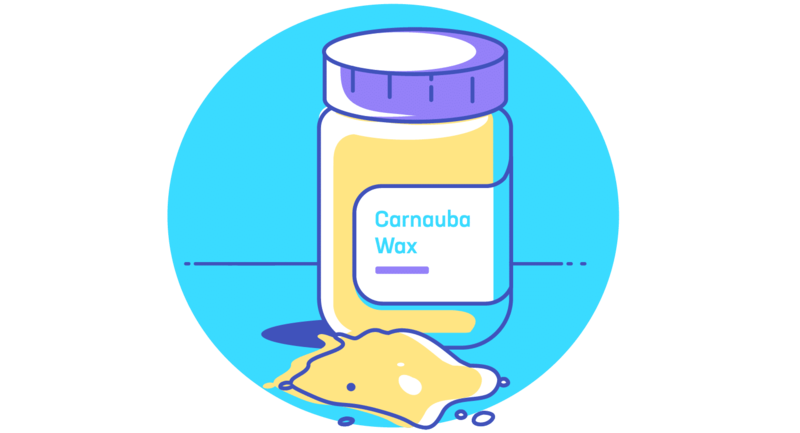 Carnauba wax is a plant-based, vegetable wax that is produced using the leaves of the Brazilian Palm tree referred to as the “Tree of Life.” The waxy substance protects the trees from the sweltering sun of South America. Carnauba wax is the preferred wax of car enthusiasts and collectors, and is commonly agreed to be the ultimate wax base for many car wax formulations. Natural carnauba is blended with oils, petroleum distillates, solvents, and other like ingredients in order to be worked into a useable car wax product. A car wax that specifies a percentage of purity in terms of carnauba refers only to the purity level of the carnauba wax used in the product, not the amount of natural carnauba wax in the formula itself. Carnauba will give you a one of a kind finish. It can bring out an outstanding, glossy shine and create a showroom finish for your car. It is noted, however, that carnauba wax will have to be used more frequently than synthetic wax products. III. What is the difference between Car Wax and Car Polish? Before we go any further, let’s make sure that it’s understood that car polish and car wax are two very different things. Car polish is used as a remedy. Polish removes the dirt, grime, grease, and scratches that are left behind after a good washing. Solvents within the polish allow it to remove, or at least reduce, impurities on the paint surface and will bring out the shine. Car polish should be used in a multistage process of caring for your vehicle’s paint because, while it can make your car look great when finished, it does not seal or protect the paint. Waxing is the only true way to protect your car’s paint and should be completed after the polishing step. IV. What are the Best Car Waxes? The best wax varies by need. A true car wax is created with a naturally-occurring wax base such as carnauba wax, beeswax, or the like. Waxes can be categorized into cleaner waxes and finishing waxes and which one you need depends on your particular vehicle. 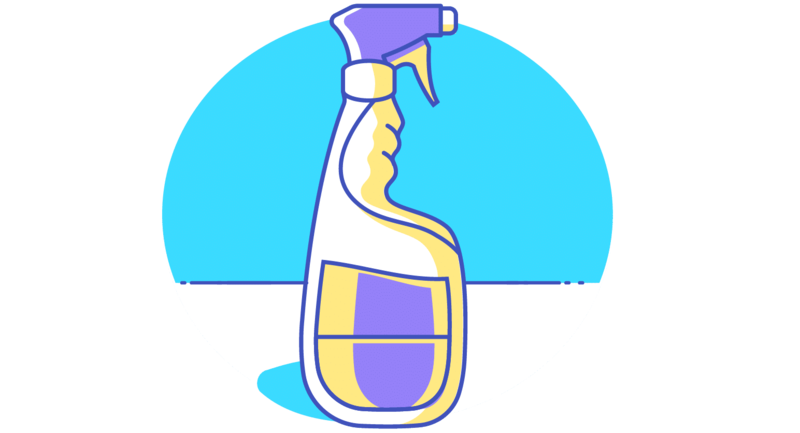 A paint sealant is a synthetically-produced product. A cleaner wax is often called an All-in-one or One-step product. These waxes contain chemicals, and sometimes abrasives, to clean the paint, remove oxidation, polish, and allow a layer of protection for your car. A finishing wax has no cleaning ability. Finishing Wax is the final step of a dedicated multistage process that includes washing, a thorough cleaning, the use of a compound, clay bar, or swirl remover, and a polishing step. It can also be used on an otherwise near perfect paint job in showroom or, at least, excellent condition. A finishing wax lends itself to a highly-prized mirror finish and an ultimate protective layer for your car’s paint. Meguiar has formulated the ideal liquid wax for maximum durability, protection, and that deep mirror shine that you’ve been looking for in your car’s paint. This synthetic polymer wax is made up of an advanced formulation that shields your car from water and other harmful influences, and application is a breeze with Meguiar’s ThinFilm technology. Utilizing 100% natural carnauba wax at its base, this liquid wax has been refined to perfection. One of the biggest advantages of this product is the ease and flexibility of application. No perfect conditions required here. Butter Wet Wax can be applied in direct sunlight, on wet paint, by hand or machine. In just minutes, you can have the pure, deep, wet shine of a showroom vehicle. Chemical Guy’s newly improved formula “Melts like butter into paint” and is better than ever in protecting your vehicle from the sun’s damaging rays, road tar, water spots, and bird droppings. Let’s talk about the most environmentally-safe product choice. Aero Cosmetics developed this Wash Wax All product over 30 years ago for use with aircraft, but it’s now a booming success with vehicle owners. This one product does it all concept has been verified to satisfy all of its claims. Wash Wax All is biodegradable, can be used with water or as a waterless wash and wax, is safe for interior detailing as well as the exterior, is a sealant yet cleans, and is the economical big hitter. One 128 ounce bottle can complete 15-16 applications for under $3.00 each. Now you can wash and wax anywhere, at any time, for your convenience. Car Guy’s Liquid Wax is a popular alternative. This liquid wax is one step in a multi-stage process. Durability is key with CG Liquid Wax, as users can expect continued protection and shine for up to one year. The long-lasting mirror finish is achieved through the use of new additives developed through polymer nanoscience that has yielded changes to the chemical properties of their liquid wax. Car Guys suggest using their Hybrid Wax Sealant after application of the liquid wax to realize the best benefits of this product. Thinking a little outside the box: Try what others have found to be a fantastic alternative; Collinite’s Insulator Wax. Collinite’s Wax was originally developed for power companies as a protective measure for high-voltage power lines. In the last 40 years, applications have included marine and industrial applications and today it’s increasingly known for its outstanding performance on passenger vehicles. No. 845 Insulator Wax is a high-grade formulation that is safe for your car’s clear-coat and requires little buffing. Use Collinite’s Insulator Wax as part of a multi-step process. Note specific instructions on proper use/liquefying step of the process. Gorgeous results are long-lasting and dependable. An advanced level of protection and impressive beading properties will sell you on this product. You can read Consumer Report’s Car Wax Ratings here. A trusty bucket and clean sponge is a must. Ideally, have more than one on hand, one for soap and one to aid in rinsing. Wash your car to remove surface debris. Make sure to begin with the wheels to avoid having any dirt or grime splatter on the car surface as you progress. Use a clay bar on the freshly-washed car to remove contaminants, pollutants, excess grime, and tar. Rub the clay bar across the wet surface until the paint is smooth and free of contaminants. A clay lubricant can be used to keep the paint’s surface lubricated while claying. Read our guide on how to do a clay bar treatment here. Use other compounds or swirl removers as needed. Some of the preparation above can be accomplished if using a cleaning wax. Apply the specific steps as needed for your vehicle. A cleaning wax requires some elbow grease as it is designed to also clean the paint. A cleaner wax should be worked into the paint surface. The worse the condition of the paint, the more energy you will need to exert. Methods vary by product as cleaning waxes come in paste, liquid, and spray forms. Read and follow the instructions of the product you choose carefully for best results. Note: Do this step especially if you are using a Multi-step process ending with the use of a finishing wax. This step is not required with the use of a One-Step or All-In-One cleaning wax. Once your car feels smooth, it’s time to polish. 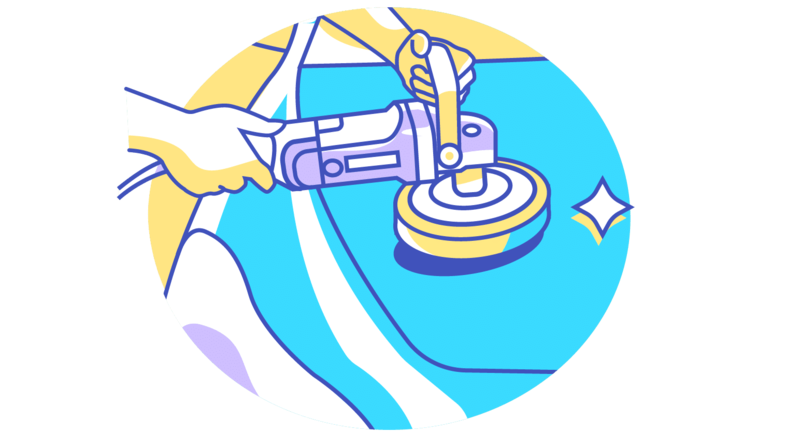 Apply the polisher to a clean cloth if polishing by hand (a dual-action polisher can be used if you have one on hand, and is safe, easy, and saves time). Apply in one small area at a time, concentrating on any areas where marks, scratches, and other damage exist. After a short time (a minute or less), wipe off the polish residue while still wet. Next, apply the polish to the entire surface of the car, working in small areas at a time. In the end, you’ll have a vibrant and glossy finish as the polish will correct the paint, remove a vast majority of fine scratches, and will bring out the natural beauty of the paint. Apply car wax using the recommended procedure outlined in the product’s specific instructions. 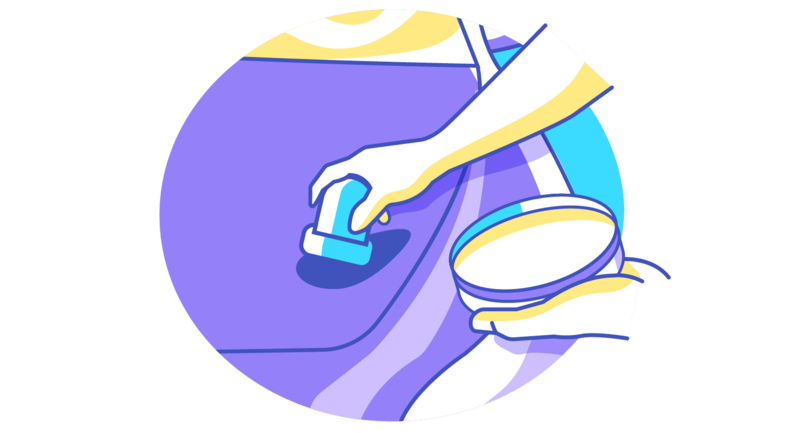 Unless noted otherwise, the wax is normally applied in the shade to prevent trouble buffing the residue from the paint. Apply car wax to a dry vehicle unless the product’s instructions say otherwise. Wet paint can cause streaks. Apply the wax in small, circular motions. Apply a thin layer of wax to the entire paint surface. Let the wax dry. Times will vary by product. Generally, a hazy, or matte appearance will let you know that it’s time to buff away the wax. Use a clean microfiber towel to remove the residue, rotating the towel frequently to prevent caking. Admire the results of your hard work! VI. How Often Should You Wax Your Car? How often you need to wax your car depends on the type of wax you prefer to use, your driving habits, environmental conditions in your area, and your specific car and what you expect from it. Most waxes commonly suggest that car wax is reapplied every three to four months. 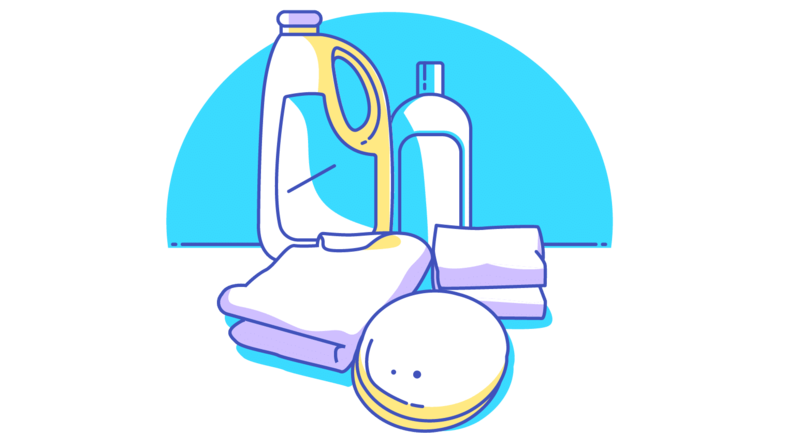 Some products will claim that you only have to use them up to once a year. But, as you can imagine, there are variables that limit this potential. Overall, taking care to shield your car from the elements on a regular basis will help to increase the time between waxing. Seeking shade, and avoiding trees where birds love to flock help a great deal, but there’s only so much you can do when it comes to environmental concerns. Smog and air pollutants are not your paint’s friend. Car Wax plays an all-important part in the proper care of your car exterior. It’s not all about vanity (but hey, you want your car to stand out, right!). Your car is a big investment, and car wax helps to protect that investment and increase the life of your car’s paint. Flying Squirrel, wonderful work. Nice formatting. Thank you. You reminded me next time to grab the clay bar. One small note to add if you don't mind. Whether washing or dusting move the mitt or duster in the direction air flows over the car in motion. This helps avoid cross surface marring. I heard this from a Meguiar's rep long ago.